Size: 18 x 24 cm / 7" x 9.4"
It may sound a little crazy at first, but there are a number of reasons why I'm doing this. Firstly, it makes my work accessible to people who otherwise wouldn't be able to afford it. Secondly, these things help to build trust. Trust is a good thing. And thirdly, it generates a type of economy which encourages us think differently (also a good thing). Anyone can see that this gal's not just any old damsel. I mean, she's wearing a bunny hat and tagging a penguin along, where is this going? "The Rabbitgirl" is part of an art series which tells the story of a mysterious Rabbitlady. 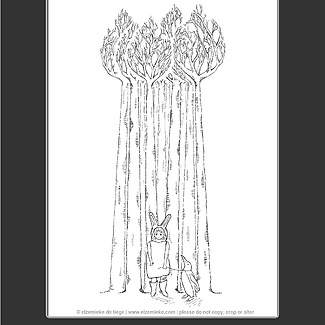 This piece also features in a handbound booklet called A Rabbit Reborn, which was exhibited at book fairs in England and Scotland. 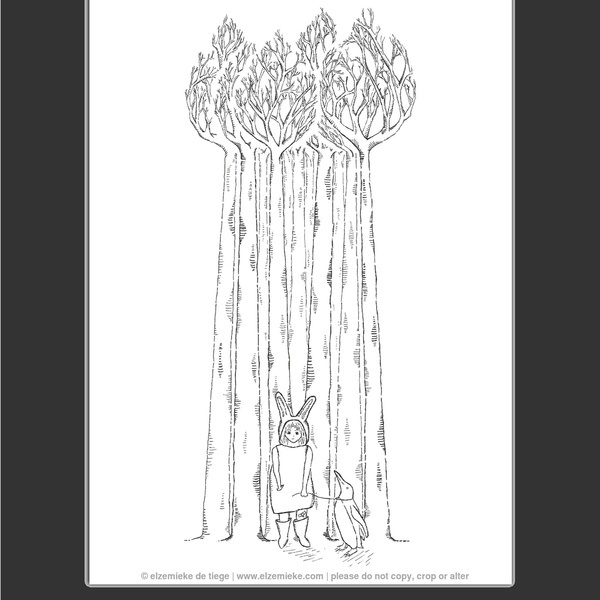 This listing is for a fine art print, titled "The Rabbitgirl". The print will be delivered with a grey passepartout (see the image at the top), ready to pop into a 18 x 24 cm frame.